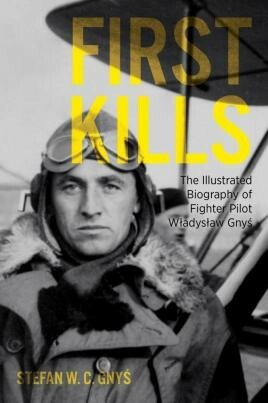 Written by his son Stefan and drawing from his logbooks, this highly illustrated biography of Władek Gnyś, the first Allied pilot to score aerial kills in WWII, is the most in-depth account of the Polish hero's life. An experienced fighter pilot, Gnyś fought in the Battle of Poland with the Polish Air Force, the Battle of France with the French Air Force and the Battle of Britain and beyond with the Royal Air Force. During the latter part of Operation Overlord (D-Day), Władek was shot down over France in August 1944 and crash landed. Wounded, he was taken prisoner but then escaped, his life spared by the enemy on more than one occasion. Written by his son Stefan and drawing from his logbooks, this highly illustrated biography of Władek Gnyś is the most in-depth account of the Polish hero's life. It tells Władek's story from his childhood in rural Poland, through his time flying in three Allied air forces during World War II, to his reconciliation with Neubert and his commemoration as a national war hero in Poland. Of his bravery and skill, there is no doubt, and as with all of the people from that era, their story needs to be told...An excellent read for all, recommended. Some among us pass through perilous times, beat the odds and live to tell about it, this is the remarkable story of one of those few. It is a compelling story of an extraordinary gentleman, all the more interesting as it's clearly written by those who loved him. This is far from a run-of-the-mill wartime story, being more of a touching and revealing look into an extraordinary life, one that fought the good fight and came through more or less intact to face a new challenge in raising a family in the peace he had fought so long and strongly for. I found this one highly fascinating… Wladyslaw Gnys might not be remembered today outside of the community he came from, but his son has done an admirable job telling the story of his father's life.